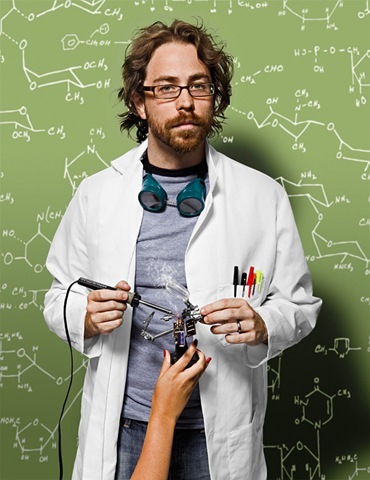 Jonathan Coulton: I have the luxury of being able to say this because things have worked out pretty well for me, and I’m very grateful for that, but I really think this is true: the best example you can set for your kids is to do what you love. People who grow up feeling like geeks soon become very practiced at hiding the parts of themselves that don’t fit in with the rest of the people around them, and that’s a terrible shame. I hope my kid loves math (or robots or elves or aliens), and I hope she doesn’t care who knows it. For our part, we here at Global Spin will continue to protect our freaks, no matter how old they are. And on the last day, or perhaps the day before that, for they deemed it a ‘leap year’ and all was confusion, the beard it came to pass. And it was soft, and luxurious, and only a little patchy on the one side, not so as you would notice at least. And the hero approved of the beard, and it was good. And there followed much clipping, and wailing, and gnashing of teeth, and the sink became covered all about.� But such was not the end of the beard. From the ashes arose a new sight, altogether more magnificent and grand. And they were sore afraid. And the new beard it burned, burned as though the sides were on fire. And the hero approved of this, and he wished it could stay so forever. But it was not to be. The beard could not last, for this was not International Beard Month or even International Sideburns Month. The mustache must come forth; so it shall be, and so it was. And the hero made the best of it, considering. And there was much rejoicing, and parties, and Miller Genuine Draft, and bowling. Amen.